Today is National Cancer Survivors Day. It is meant to demonstrate that life after a cancer diagnosis can be a reality. It has been celebrated since June 5, 1988. If you’ve followed me and my career, then you know that October is a special month for me. That’s because October is breast cancer awareness month. Breast cancer is the second most common kind of cancer in women. About 1 in 8 women in the United States will get breast cancer at some point. The good news is that many women can survive breast cancer if it’s found and treated early. The most effective way to do this is with a mammogram. This screening test for breast cancer can help find breast cancer early when it’s easier to treat, but many women ignore this simple, but crucial diagnostic test. National Breast Cancer Awareness Month is a chance to raise awareness about the importance of early detection of breast cancer. To help spread the word about mammograms and encourage communities, organizations, families, and individuals to get involved, I surround myself with hot pink this time each year. Last year, I created three pink-themed works of art for Beall’s Department Store. 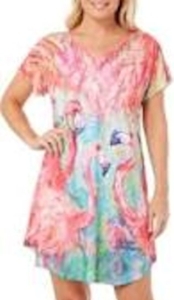 The designs appeared on women’s T-shirts, housewares, and even quilts that Bealls sold during Breast Cancer Awareness month. The paintings were titled Pink Lady, Pink Racer, and Pink Power. Pink Lady depicted a sailboat. Pink Racer was a bicycle. These paintings conveyed a sense of hope and eventual freedom from this devastating disease. 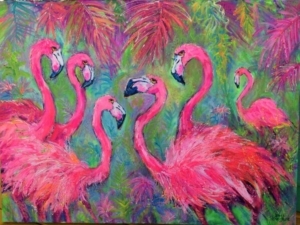 The third painting depicted a bevy of pink flamingos. 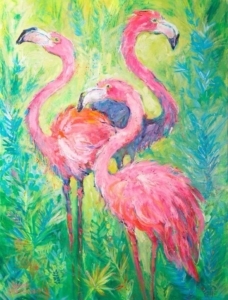 The flamingos symbolize the support that women give each other to battle breast cancer. So if you’re a woman, get a mammogram. And you don’t have to wait until October. For women 40 or older, they’re covered by insurance, usually with no deductible or coinsurance.